Devious Mahjarrat Sliske is planning a big show for his own personal entertainment, and you are personally invited. Can you get the last laugh? Receive your message from Sliske's follower Relomia. 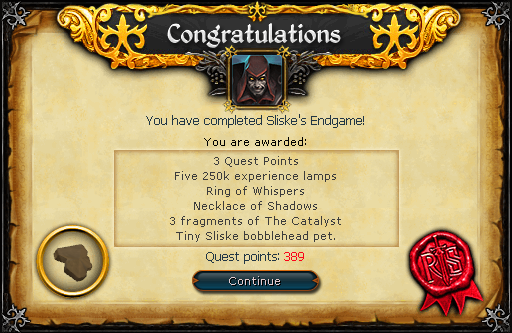 Once you have all the required quests complete, you will eventually get a message from Relomia that Sliske's endgame is about to commence. Teleport to Draynor and speak with Relomia at length. She will tell you that you are invited as a participant in Sliske's game. She will also ask you to personally invite all of the gods. Accept the quest. Head north and enter Death's office through the green hourglass above the Draynor lodestone. Speak to Death or Icthlarin to invite Icthlarin. Armadyl is in his tower east of the clan camp. He is on the top of the tower (but does not show up as a yellow dot on the minimap). Hand him his invitation. Saradomin is in the White Knight's castle in Falador. He is by the altar and Sir Vyvin. Zamorak is in the Black Knight's fortress. To get in you'll need either an iron chainmail and bronze helmet OR elite black knight armour OR black knight captain gear (from the Death of Chivalry). He will be on the first floor (one up from the ground floor). Speak with him and hand him his invitation. Seren is where she always is, in the Prifddinas tower of voices. Conveniently, Zaros will be there as well. Hand them both their invitations. For those who have just joined us for this very difficult section, welcome to the program! Speak to Relomia again and she will tell you to meet her at the Heart of Gielinor (God Wars 2). You're going to need some decent combat gear for this part. The Heart of Gielinor is situated west and slightly south of Nardah. After a bunch of drama, Sliske will summon an undead Nomad. Despite his previous ferocity, this nomad will be a fairly easy kill as he has no abilities. Now you will find yourself in a maze. The objective here is to get the the northeastern most room. The maze has two floors, so you basically have to complete two mazes with the same objective. Each maze requires you to complete a few puzzles and watch a few cutscenes. If you have not seen Sliske speak recently, you are going in the wrong direction. Expanding the minimap on the NXT client will allow you to see the maze far better. The cutscenes involving the gods only act to serve story. The puzzles generally involve four masks and light. Change the masks to change the image. Sometimes the game asks you to do something that does not make a neat picture. Assuming you did not complete the maze at a lightning-fast speed, a god will have completed the maze before you. 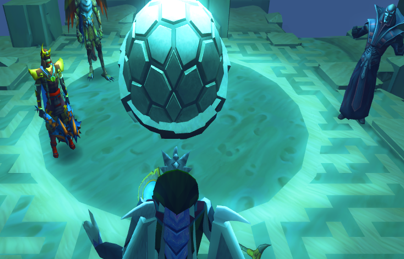 This could be any god, but it will most likely by Armadyl. Sliske will tell you to race for it. You can try to win the race by pulling delay switches that will hurt his/her progress, but your opponent has fewer natural obstacles in his/her path and will have an easier time than you. Regardless, whoever wins will be forced to hand over the Stone of Jas to Zaros, who will momentarily hold it until the dragonkin destroy it. After the cutscene, you will find yourself in a battle with Sliske's wights. The goal here is to keep killing the wights until the bar is completely green. This should be fairly simple. After you have done this, you should bank if you are running low on food because the next battle will be much more difficult. In the next battle, you will have to face Nomad, Gregorovic, and Linza the Disgraced. It is suggested to kill Nomad first, then Greg, then Linza. Nomad will have a special attack involving dropping mines. If you are around one of these mines when it explodes, you will be hit with heavy damage. Once you have killed him, turn to Greg. This version of Greg will be much tamer than the one found in normal play; you should be able to get away with nothing but soul split if you have weapons over tier 90. Greg will summon a red spirit to heal him 20,000 LP, which you can stop by killing it. After Gregorovic, turn to Linza. Linza will have two special attacks: one where she gets into a healing position. To stop this, keep attacking her. Her second, more dangerous position is a charge position. When she begins to charge, immediately hit the freedom ability and run in the opposite direction. 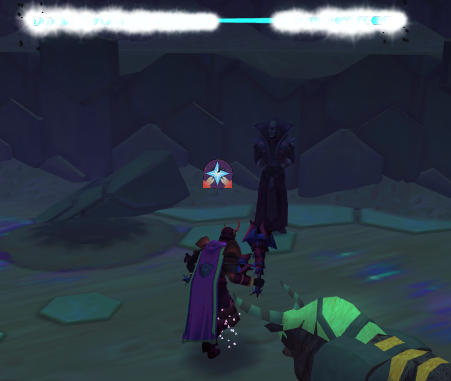 With his minions down, Sliske will decide to go after you himself. It is suggested to use magic attacks and protect from magic here, and make sure you bring 5-7 prayer potions. Attack Sliske, and watch out for the what we will call "shadow hands" because there is truly no other way to describe them. He will spawn these under you five times in a row. When he spawns one of the shadow hands under you, run around until you see all of the shadow hands spawned and then begin to attack him again. One hit by these shadow hands will reduce your lifepoints by around 25% of your maximum lifepoints, so avoid them like the Ardougne Plague. Sliske spawns these hands at regular time intervals, so you should be able to anticipate the spawns. Generally he spawns the hands 2-3 seconds after he shouts something, such as "DIE." Make sure you pay attention to your prayer points as he decreases prayer at an accelerated rate. When you do this, he will return to the field of battle. At 10,000 life points he again will return to his ledge, and you will have to do another option. After the third time, he will return to the ledge again and you will have to use the final option you have not used. After this, Sliske will have no option to fight you and will not teleport at 10,000 lifepoints. In all, you will have four fights with Sliske that must be fought continuously. Once you get him to 0 lifepoints, you and Sliske will return to the normal plane of existence. You will have to kill him again, but this time you will have unlimited adrenaline. This should not be difficult. 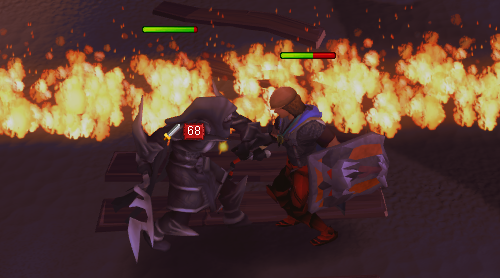 After this fight, you will kill Sliske in a cutscene. With Sliske extinguished, you will find yourself with the elder god Jas. After a discussion, you will return to the surface where several other gods speak to you. Icthlarin will ask you to return to Relomia, where you will mysteriously black out before getting your reward. Congratulations, Quest Complete! The catalyst fragments, when combined with the ring of whispers and necklace of shadows, will provide bonus experience when training certain skills. The runecrafting, farming, and hunter catalysts can be combined to make a combined catalyst, which will work for all skills. However, using a specific skill catalyst may provide benefits if you are only training that specific skill.